St. Paul African Methodist Episcopal Church, 101 S. Merritt Mill Road, has big plans in the works to transform a neighborhood in need along Rogers Road in northern Chapel Hill. As a benefit for the St. Paul Village development project, the first annual St. Paul AME 5k Walk/Run will add its name to a thriving throng of local road races on March 2. “There won’t be any borders on the effect (the 5k and project) will have on the area,” said Chapel Hill resident Joseph Bynum, who has spearheaded the 5k effort as one of the race chairs. Bynum said the idea for a 5k came about six months ago, when wife Rose Bynum, chairwoman of St. Paul’s capital fund committee, was adamant about thinking up new, creative sources of revenue for the church’s projects. “She challenged us to go outside the box with a fundraising idea,” he said. Now, after months of organizing and planning for St. Paul’s first 5k, the only item left on the agenda is getting racers to the starting line. The race is set to start at 8 a.m. at McDougle Middle School in Chapel Hill. The race will make a loop through the town and end back at the school. A full morning of festivities will follow the run, including games for kids, refreshments and an awards ceremony for race participants. “It’s going to be a family day, too,” Bynum said. Holding the event in an area chock-full of walkers and runners brought a highly encouraging community response, he said. As of the beginning of February, more than 120 people were signed up to race — a number Bynum said he’s pleased with, given that it is the pathfinder event. Two weeks before race day, a steady stream of entry forms are still piling up in the church office. Moses Carey, 67, a Chapel Hill resident who attends St. Paul with his wife, said he signed up both to exercise and to support the church’s worthy venture. He noted that it is more about the cause than the competition for him. 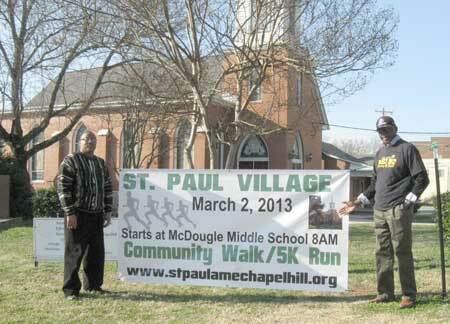 The 5k run is the first community-wide fundraiser held for the St. Paul Village project, said the Rev. Thomas Nixon, the pastor at St. Paul since 2004. Talk of building a new church and facilities that would provide necessary services to the community began in late 2005, he said. “We knew we couldn’t do a lot on the current property because of lack of space,” he said. With a vision of expansion in mind, the church purchased 20 acres of mostly vacated land in northern Chapel Hill in 2007. But the land won’t be lying low for long, once St. Paul puts healing hands on it. The village’s vast blueprint includes not only church facilities but also senior housing, affordable housing, a conference center and a multilevel, fully equipped gymnasium. The current sanctuary will also be moved to the new lot and used as a chapel. Having children around will help the seniors living on the property stay active and make the place “intergenerational,” Nixon said. A touch of culture will be another feature — plans are in the works for an African-American museum, dedicated to black history in North Carolina. Coincidentally, the new museum building was plotted atop an old basement that turned out to include 19th century slave quarters. Nixon said they now plan to incorporate the museum with the surprise discovery. “We’re looking forward to keeping history going,” he said. Despite the many amenities for seniors in the new village, Nixon said it took time and effort to convince older congregation members that the multi-million-dollar project was worthwhile. But Nixon said he constantly emphasized the impact the development would have on every age group in the church — and support has steadily strengthened. “There’s nothing proposed on here that’s not a need today,” he said. Phase one of St. Paul Village, including the new sanctuary, fellowship hall, church offices and a daycare facility, could break ground late this year or early next year, Nixon said. The development will upgrade the whole area, Bynum said. “People I’ve talked to (who live in the community) can’t wait for it to get started,” he said. 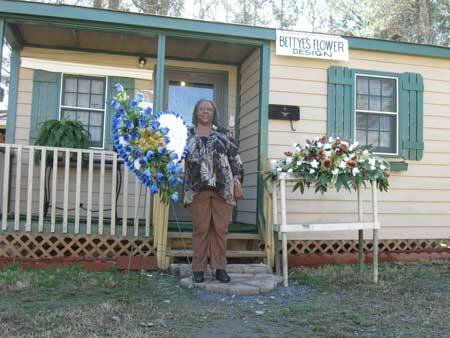 One community resident thrilled to welcome St. Paul is Bettye Jenkins, who runs Bettye’s Flower Design on Purefoy Road, just off Rogers Road. Jenkins, 67, has been whipping up colorful and creative flower arrangements for the Chapel Hill-Carrboro community since 1996. A quaint shop building, a well-tended mobile home and a garden sit on her land. But her tidy property hasn’t always appeared so welcoming. Many untouched mounds of waste remain throughout the area, Jenkins said. “It’s not a good impression for people coming to me and seeing all that trash,” she said. But Jenkins is a devout woman of prayer — she’s prayed for a long time that God would come in and beautify her community, she said. “St. Paul is going to be a blessing,” Jenkins said. The increased customer traffic to her flower shop will be nice, she said, but it will play second fiddle to the impact the village will have on others. She said she’s excited to see St. Paul and its people blend in with the diverse community already in the area. Now, with approvals and permits obtained and some of the $4 million for the first phase raised, all that remains is a monetary push over the next year to get the project’s ball rolling, Nixon said. “We’re excited. We’re ready to go to the first level (of the development),” he said. But Bynum is already looking further into the future — he wants the St. Paul AME 5k to become an integral part of Chapel Hill-Carrboro culture. The 5k will act as the primary money stream for St. Paul Village while the project remains under construction. The event will also benefit the local Habitat for Humanity and several of the church’s other outreach ministries, he said. “We hope to do the 5k in perpetuity, year after year,” he said. Although there is always apprehension with new endeavors such as the 5k and the multi-million dollar village project, Bynum said he’s confident that the community will jump on board and share in the excitement.